All Moms have been there. Someone in the house gets sick, then everyone in the house gets sick. As the Mommy and ‘Nurturer-in-Chief,’ you don’t bat an eyelid to provide comfort and love your family back to health. Then, once everyone seems to be on the mend, ‘BAM!’… you get sick. You get super sick. Maybe it is because you wore yourself out taking care of your kids and husband. Maybe it is because you were still nurturing others when you should have been tending to the beginning stages of your own sickness. Regardless, you are here now. You are at home, feeling like you can’t even move, with one or more highly energetic toddlers expecting their #1 source for entertainment to deliver. Ugh. This conundrum and all over yucky situation hit me like a brick to the head today because yep, I am the one with the horrible chest cold. To add insult to injury, I seem to have lost my voice. So, when you are in this situation, what are some activities you can either do with your kids, or spin them off for a Mommy-kid version of parallel play, so that you can get some needed rest, and so that they are not spending the entire day watching TV and playing iPad games? Well, here are 25 to 30 ideas I came up with based on things that are already in our house. 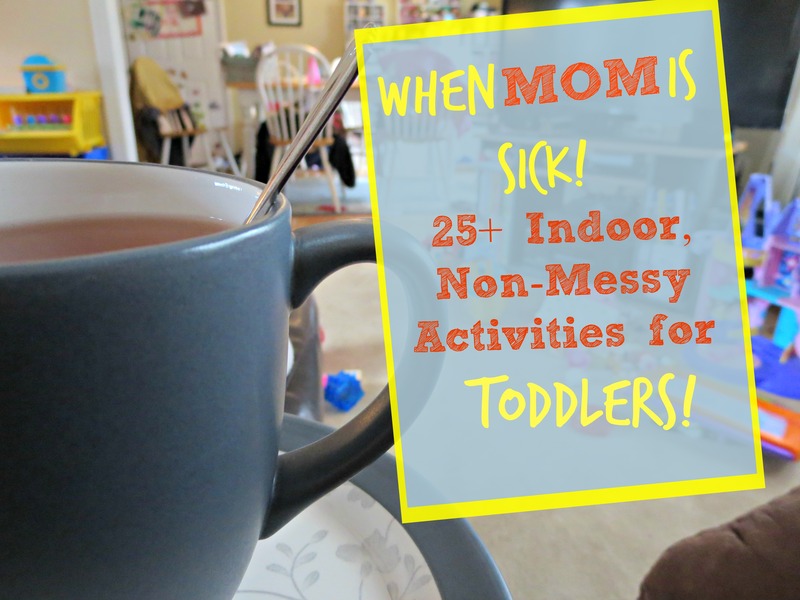 My ground rules for ‘Mommy sick day’ survival were simple: nothing terribly messy, nothing with complicated instructions, nothing outside (or what is the point of me recovering), and reading is out because I can’t talk. Have a Teddy Bear picnic. Have a princess tea party. Play with any of your Little People sets (we have Noah’s Ark and the Princess Songs Castle). *You are sick after all.. give yourself a break! So, I have survived my sick day home alone with Sweet Pea so far. She is now ‘pretending’ to take a nap but at least I am getting a little respite. We have already burned through many of the items on this list… but that is ok. They are fun (and low-key) activities to burn through! So, the next time you need to be low-energy while attending to the needs of your high energy kiddo, pull out this list or make your own! Whatever you do though, I hope you are able to get some rest so you can kick your sickness to the curb! For more ideas for non-TV indoor activities, check out these links! Previous Post: « 3 Fun and Easy Apple Crafts!